On my way back from a fun trip to Niagara Falls last week, I stopped in at the Bibles for Missions Thrift Shop in St. Catharines, Ontario. I first wrote about this little gem of a shop in June, when my sister introduced me to it. You can read about it in my Thrifting Sisters post. I have been trying not to visit thrift stores lately, in order to save money and stop building clutter in my home. But, I was missing the thrill of the hunt. So, I set myself a goal of spending no more than 10 bucks (plus tax). I knew that if I could achieve my goal anywhere, it would be at Bibles for Missions. I wouldn't come away with much from Value Village or similar places for $10. By the way, did you know that the slang term "buck," used in place of the word dollar, derives from a coin struck by the Hudson's Bay Company during the 17th century, with a value equal to the pelt of a male beaver, or buck? I didn't either. I just looked that up. 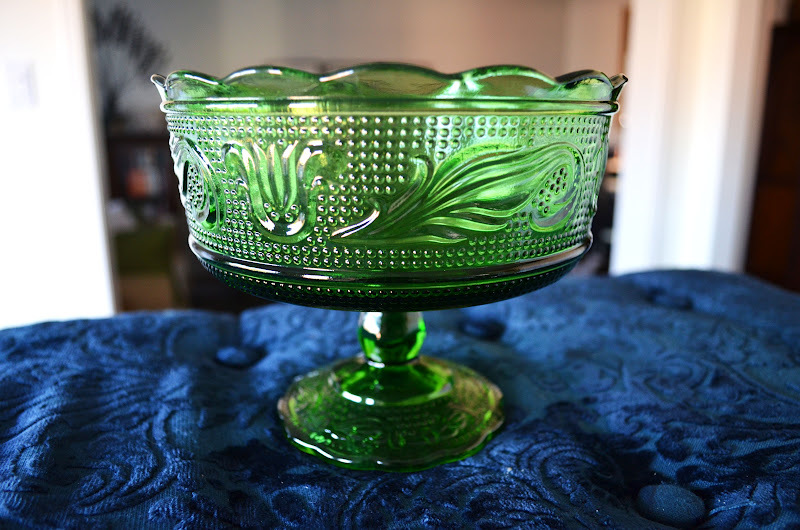 Anyway, this lovely green glass dish set me back only $2. It is stamped on the bottom with the words E.O. BRODY CO. CLEVELAND O. USA. I discovered that Brody glass was first produced for The E.O. Brody Company, which was founded in 1958 in Cleveland, Ohio, by Ernest Oscar Brody (E.O.). Mr. Brody's innovative idea was to sell utility glass floral containers exclusively to florists and to market them through wholesale florists who in turn would sell to retail florists. 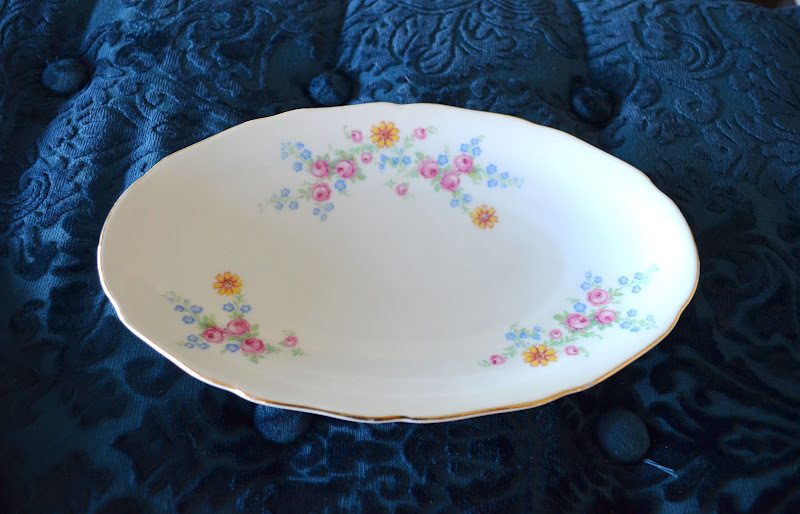 I love the shape of this pretty floral plate, which is marked RGK Czechoslovakia. Wikipedia says that the RGK stands for porcelain manufacturer Rudolf Kämpf. The company was founded (under a different name) in 1908, and continues to produce handmade porcelain today. The plate cost $1. I have no need for this set of vintage jars, but I was drawn to the holder, the rose-patterned lids and the matching little white spoons. The volunteer at the thrift shop suggested the jars are for jam and honey. What do you think? The set cost $3 and is in perfect shape. 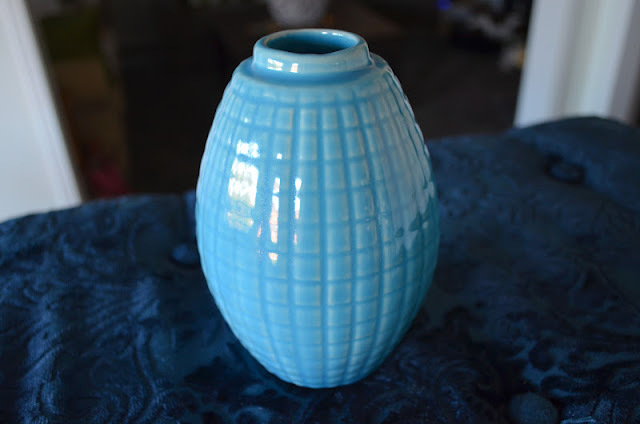 I also bought this cheerful vase, in a lovely shade of blue. It was $2.50. 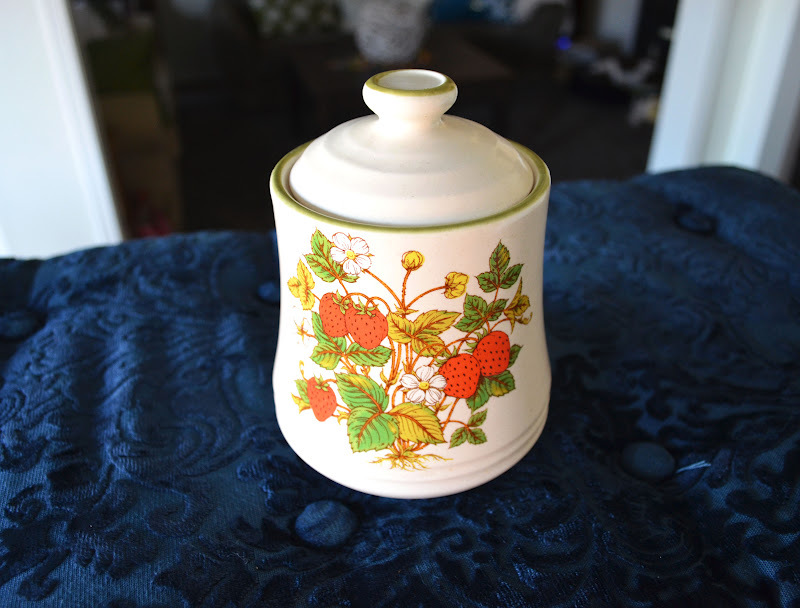 I was attracted to the strawberries on this lidded jar. And for only $1, how could I resist? Unfortunately, I dropped the lid when I was bringing it to the sink to wash it. It is mainly in two pieces (with a few shards missing from the inside), so I will glue it back together. 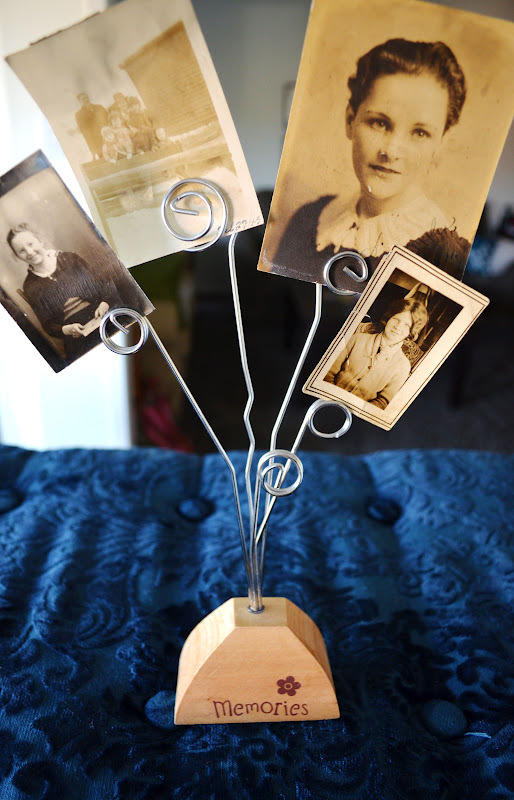 Finally, I picked up this photo holder for 50 cents. My mom gave me a few old family photos recently and I had them lying on my desk. I thought this would be the perfect thing to keep them safe and on display. Okay, now let me do the math. Yep, $10 exactly. And these six items were literally the only ones I put in my basket. I didn't have to put anything back. Kind of strange. Kind of like they were meant for me...and my 10 bucks. Good job sticking to a thrifting budget...I need to try that (yeah, right! :). I once dropped an aqua glass insulator on my tile floor and sent bullet-like shards of glass flying through the kitchen, if that helps. Love the aqua vase, BTW! OH WOW!!!! congrats on the budget! thank you so much for visiting us over at Junkin Joe! : ) So thrilled to have Heather join us and now you...how awesome is that! : ) Going to pop up top and become your newest followers! sending hugs and WELCOME! AHA finally the Canadians are responsible for something that is used North America wide - Buck! Great finds. I love Bibles for Missions Thrift as it is the cleanest well organized thrift store ever and the ladies who work there are so nice - no matter what town you go to. I have only been to the one location so far, but I look forward to trying some others! I love a thrift store but I have to temper the number of visits because, like you, I would have WAY too much stuff in my house. It IS indeed a problem, isn't it? I try to use the stuff, but how many dishes can you use? Beautiful and a great find! The twin jars are perfect for two kinds of mustard these days when specialty mustard's are so trendy. That's my favorite item you bought. I saw a lot of Brody stuff when I lived in Ohio, so you have explained that! The little compote is very useful as a serving dish. Green is very good for serving white or yellow vegetables. I have broken items and repaired them but I usually repurpose them. Your strawberry dish would make a cute kitchen arrangement vase. My favorite kind of posts are those when people show what they thrifted! Thanks Caitlin. It was fun! 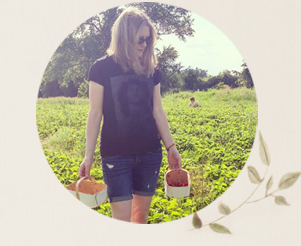 Those are super cute finds! Thanks! I am glad you like them! The best thing for me is to avoid the stores so I don't even see the bargains! Fun finds! I love the condiment (?) holder. Great finds as usual! 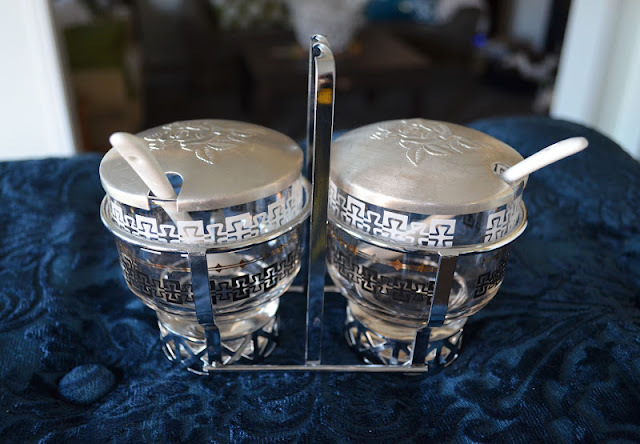 I don't think I've broken anything but my mum got a gorgeous caraffe as an engagement present in the mid-late sixties, had it stored safely for decades and her sister broke it when she took it out of the cupboard. I think I was the most devastated! Her sister must have felt terrible! I'm kind of getting used to things breaking, thanks to my kids. But, it still hurts! Well done and such a great idea to set yourself a limit of $10. Then thrifting really becomes a treasure hunt. And treasure you did find. I really like the green pressed glass bowl/vase and the strawberry container. Shame about the lid. Yes, the limit of $10 is effective. I think I will keep doing that. It forces me to be more selective, and storage is then less of an issue! If the silver condiment set were for sale on Etsy I would totally get it, love it! I'd put my home made pineapple jam and my strawberry preserves in the set! Oh that would be so pretty. 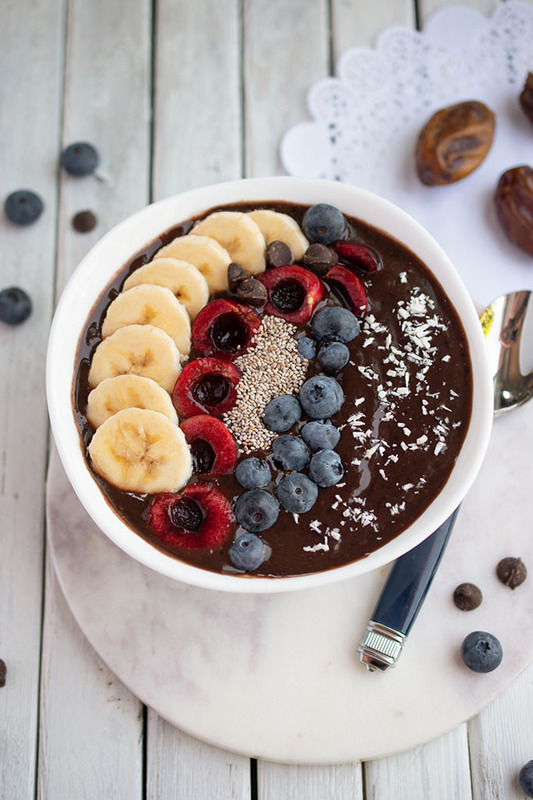 What beautiful treats plus you managed to stay within your budget, how neat! I just wish we had thrifting over here, I would go crazy with little "gems"! You don't have any thrift stores, Sherry? I like it too. It looks like it might be new. Nice! That green glass dish is beautiful! One time I found a red vintage Fiestaware plate at a garage sale for $1..then when I got home I tried to carry too much in at once and the plate fell on the ground and busted into a million pieces. I was SO mad! Oh, Laurie, that is just something I would do. I will carry mountains of stuff rather than make two trips! Yes, I think that's a jam jar too...so very pretty and awesome price. Love your thrifty finds. The jam jars in the caddy are very cute! I really love the blue of that vase also! Wonderful thrift finds! Love the jam jar set! Sorry so late for visting! Thank you for joining TTF last week. Have a terrific day! Better late than never, Diann! ;) Have a great weekend. What fabulous finds! I live in St Catharines and visit that shop often, it is a gem of a shop! Are you looking for a fresh new Hair Salon experience?